This Austin Covered Patio Serves as the Perfect Outdoor Man Cave and Much More! This patio cover in Austin, TX, by Archadeck of Austin is a true masterpiece of design. As you can clearly see from the images, the space appears as if it has stepped off the pages and into reality from one of those glossy home & garden magazines. Jim Schallon, our lead designer, came up with the concept on this structure. Even though some would say this patio cover serves as the ultimate outdoor man cave area, the benefits of the space exceed just enjoying the big game outdoors. This space serves a multitude of uses, it can evolve as your needs evolve. From outdoor entertaining to relaxing by the fire. The presence of the TV provides a space for family movie night, watching home videos and much more! The possibilities are as endless as the imagination. The floor of the patio features a textured overlay finish, this was present on both the existing (older) patio and the new concrete patio and featured a custom designed Texas Star in the center. Having the advantage of a textural finish for the patio not only increases the aesthetic appeal of the space adding to the rustic nuances present in the natural stone used throughout the project, it also increases traction within the space. This makes the area easy to navigate even when outside weather conditions may be damp. The focal point of the space is surely the large outdoor fireplace. Archadeck of Austin designed and built this fire feature and custom fire boxes attached using the same all natural stone used on the facade of the existing home. Since the homeowner’s wanted to attached a TV over the mantel of the fireplace, we ingeniously created a built-in space under the hearth that holds the electronic equipment for the TV. By working with the homeowner’s audio-visual professional, conduit was ran to perfect this feature and in addition a speaker system was installed within the ceiling of the space. Not only is the addition of these elements innovative, it also ensures the wiring and cords stay out of view promoting a clean, wireless atmosphere. 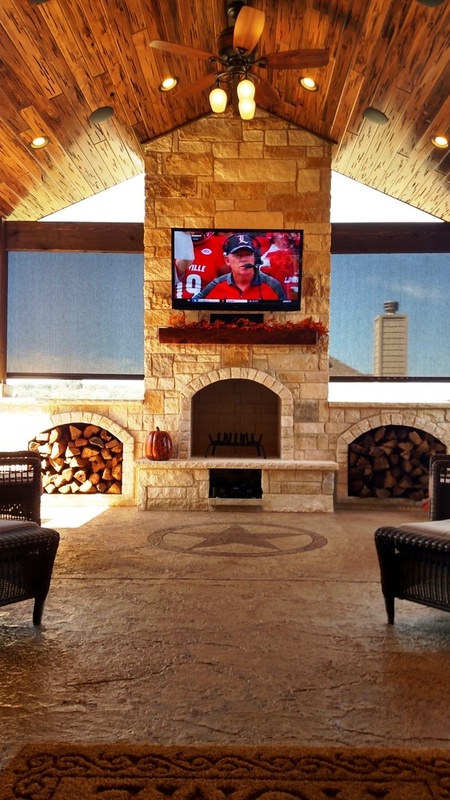 The exterior sunshades directly behind the outdoor fireplace were installed by a local company here in Austin. Austintatious Blinds that specializes in a diverse array of blind and shutter solutions. From custom wood shutters to polyscreens and other shade materials for exterior and interior residential and commercial use. These retractable shades allow the homeowners to block out the late afternoon sun. The ceiling of the patio cover is simply stunning! 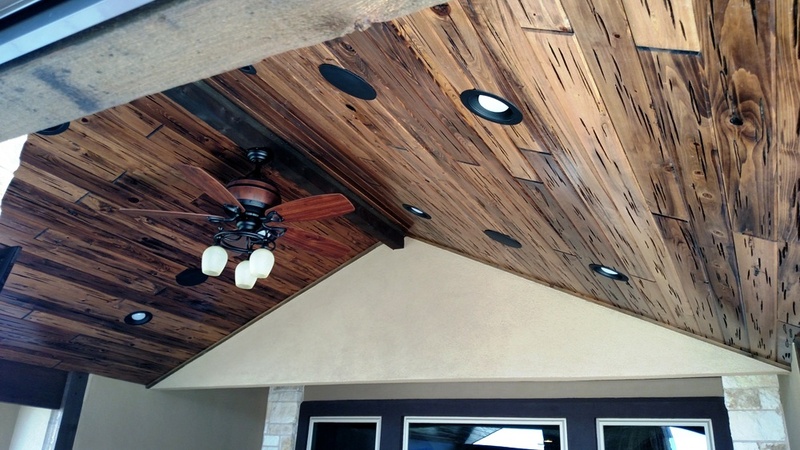 We used Synergy Cypress E-Peck tongue and groove to get this amazing rustic look. Synergy products require no staining or sanding and come with an exterior grade protective polyurethane finish. You can also see a continuation of the rustic nuances evident in the ceiling are carried through the entire design including the cedar-wrapped posts. The railing we used is also cedar with aluminum balusters. The homeowners are elated with the design, the process and of course, the finished patio cover! 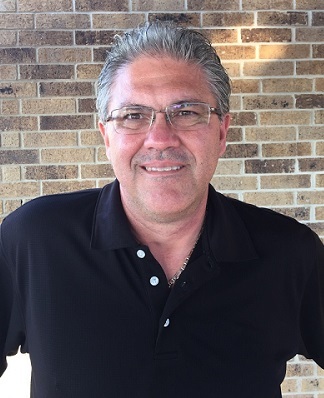 If you would like to learn more about creating the ultimate outdoor room for your home, contact Archadeck of Austin today at (515) 259-8282 or via email at jim.odom@archadeck.net. This entry was posted on February 8, 2017 by austinporchandpatio. It was filed under Archadeck of Austin, Covered Patios, Covered porches, Natural stone outdoor structures, Outdoor fire place, Outdoor rooms, Patios, Patios and Hardscapes, Western red cedar and was tagged with Austin covered patio, Austin Covered Patio Builders, Austin custom covered patios, Austin outdoor room, Austin patio covers, Austintatious Blinds, outdoor fireplace, SynergyPrefinished Wood For Ceilings And Walls, Unique patio designs Austin TX.